Doug goes on to explain how Valve are “going to start talking to people who specialize in [the area]”, so this news doesn’t necessarily mean we’ll be seeing a hardware division at the company any time soon. I can’t help but wonder why they want their own gamepad in the first place though, given that the Xbox 360 Controller mentioned by IGN (and long owned by myself, I’m happy to say) has already become the de facto standard. What do they hope to achieve that it hasn’t? A trackball, perhaps? The smart thing to do would be to make their Steam gamepad XInput/Xbox 360 compatible, so they would stick to the de facto standard. Plus they already support XInput on 360 / Orange Box (probably?) so they already know the API. It does seem weird that they’re considering it, though. Seems slightly orthogonal to what Steam is about. I was thinking more in terms of branding and design than technology. XInput supports 4 axes, 8 buttons, and a D-Pad. This is exactly what a 360 controller offers, so to add something like a trackpad, they’d have to remove a thumb-stick or a trigger. Considering that most (Wii aside) controllers have standardised on a two-stick, 4 (main) face with shoulder buttons configuration, it seems unlikely that anyone would be mad enough to change it, unless they’re hitting a really specialised market, like flight simulators, or some ultra-niche game. I’d say in terms of functional design, such a beast would be very conventional. I’d say it is mostly a propaganda excercise. I mean, what are the iconic symbols of a platform? I’d say first was the console itself, a close second is the controller. Steam has no physical console to design, but they can have a controller. It’s like… countries wanting nuclear weapons. Sure, they’re of no practical use without ensuring your own anihilation, but they afford you a certain respect. 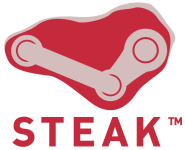 I’d wager this to be a move along the same vein – Steam asserting a profile as a platform in and of itself. I would think the Logitech Rumblepad is more of a standard for PC gamepads than the 360 gamepad. I can’t remember the last time I used a gamepad on a PC though (2003…mabye?)…. If Valve is really going to bother with making a Steam gamepad perhaps they should follow the rest of the PC game dissers and just abandon PC gaming for the consoles where the standard if a gamepad. (I have no problem with gamepads on PC I just don’t see a point in a useless Steam gamepad). I’d actually prefer it if their gamepad weren’t 360-compatible. Then it might prod companies doing ports to actually put some effort into their interface, unlike, say, Lost Planet. I think what valve will do is just pick a controller and stick steam branding on it, right now the best candidate seems the standard 360 controller. It might seem pointless but it’s about marketing and perception that PC games can use controllers and I’m sure they’d sell it “trough” steam too. Still it’s a shame most games aren’t properly ported in a way to make keyboard/mouse actually viable as it should (first example that comes to mind is Resident Evil 4) even though controller for some games just make more sense.